My school is made up of just 4th and 5th grade. Together there are 18 classes. I love this set up because we are an elementary school, but provide many opportunities for students to work on and achieve responsibility through after school activities, choices and classroom lessons to prepare them for middle school. The Question Formulation Technique (QFT) I used in my class this week was a perfect way for students to show their responsibility of learning. 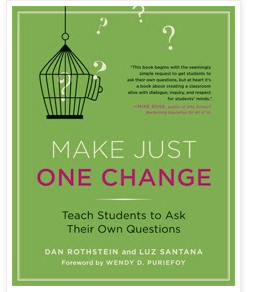 One of the new educational books I started reading this year, with my Coach, Kara, is Make Just One Change, by Dan Rothstein and Luz Santana. The strategy made SO much more sense to me when I was able to discuss and test out the technique with colleagues and immediately my brain began turning as I thought of ways I could test it out in my classroom. If you know me, you know I LOVE to try new techniques, strategies, and ideas. I consider myself a motivated risk taker. This year I made it a personal goal to have my students take ownership of their learning through questions that drive their instruction. Not an easy task, if you ask me, but I was determined and with the help of our ridiculously smart reading specialist, Kara, I am able to have support and encouragement along the way. After reading and understanding those two facts, this strategy sounded like a perfect plan to me! 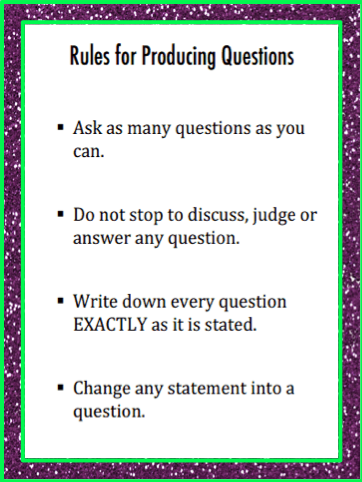 The first step to using this questioning strategy in the classroom is to develop a Q-Focus or a Questions Focus. Since this was the introduction to our new unit, the students didn't really have much background knowledge on the topic. I told the students that we would be trying out a new technique through questioning. 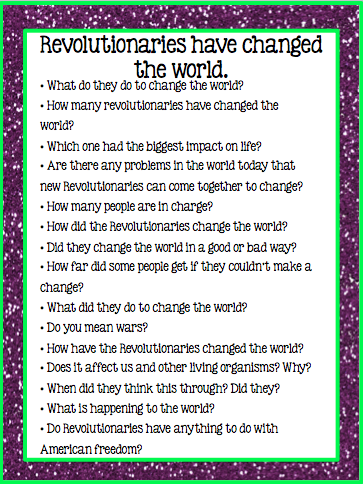 The questions they came up with today would allow me to create lessons for the unit. They were so excited to "know" they had a part in what they were going to learn. 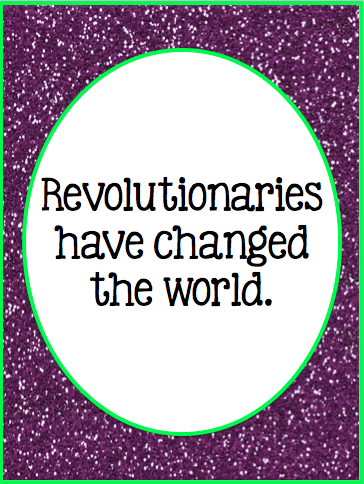 The Q-Focus I came up with was "Revolutionaries have changed the world." Once my students quickly assembled into their prearranged groups, I reviewed the rules on the Smart Board, set a time limit of five minutes to allow the students to quickly write as many questions as they could about the statement, circulated through the groups, and watched as the level of engagement and rigor rose in the room! I reiterated out loud that spelling did not matter and I was just concerned about everyone getting their thoughts out on the paper. While walking around observing my students I realized that I have either underestimated their questioning ability or have taught them a lot in the past five months. (I am going to pretend it is a mix of both!) Every student was able to ask questions! The day before this lesson, I received a new student from Brazil, she was even trying her best to write out questions! The students were following the rules amazingly, sticking to the time limits, and working together so well that I wanted to jump up and down and scream "Hallelujah!" Instead, I just grabbed my camera and took pictures of the students in action. When the timer went off and it was time for the students to move on to the next step, everyone listened to directions attentively. The next step was to number the questions. This step only took 2-3 minutes. I explained it wasn't a competition between groups, but instead "it just gave us satisfaction about how awesome we were for just coming up with ___ questions in five minutes about one statement!" After numbering, I gave the students another two minutes for each student to code their questions with an "O" for an opened question or a "C" for a closed question. I briefly reminded students the closed questions are usually one word answers like; yes, no, a date, time, or a person's name while an opened question requires more of a response. Both questions are perfectly fine at this point because we needed to build some background knowledge on this topic. The next step involved the students working together. 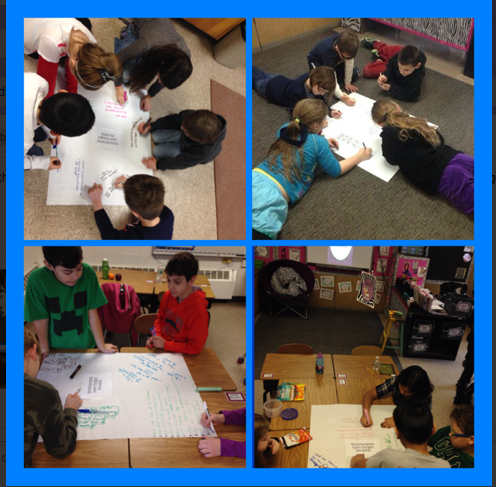 Each group was to come to a consensus choosing the three most important questions from their chart paper. I made sure the students knew it wasn't a contest and did not matter whose question was chosen, but rather what questions were the best. Each group had four minutes to pick three questions, circle the questions and meet on the tech carpet. Finally, it was time to discuss. Up to this point I really did not do much talking during the lesson, basically I was playing a different role. I led students to value their own thinking. This process of teaching students to ask their own questions allowed the students to communicate what they needed to around curriculum. The difference is that the students were thinking and doing more, rather than me, the teacher. Together, we gathered on the tech carpet and each group presented their three circled questions. They briefly explained why they decided these were the most important questions as I typed them onto the class list. (Since I teach two classes, I have two class lists.) I promised the students that all of their questions would get answered before the unit ends. We made some observations while looking at the list. The students noticed the same question repeated multiple times, and we discussed why that would possibly happen. The students agreed that must be an important question. I am going to use the poster maker to blow these lists up and as we go through our next unit, students will check off the questions as we answer them. Therefore, the students are generating my lessons through their questions! As I was observing my students become so involved in this process, I was so excited to write this blog post to share my success. 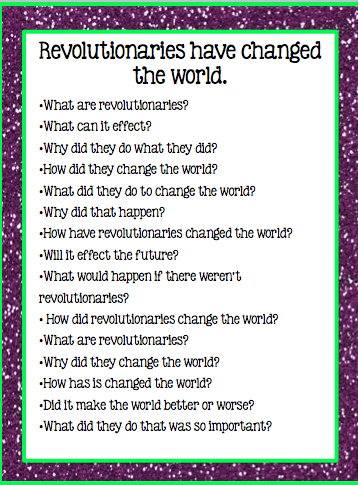 Not only are my students wicked excited about their new unit on Revolutionaries, but now I have a sense of where to go with my lessons and how much the students know about the topic. This strategy worked out awesome. I would definitely use it again. It didn't take longer than 30 minutes and I was able to learn so much about my students during that time. Since this technique was so motivating and powerful it should fit perfectly into my friend Joanne's linky, over at Head Over Heels for Teaching. Wow, what an inspiring post! So simple but so very effective. Thanks for sharing! I love how you structured this and can see how I can incorporate this into my classroom. Thanks for sharing! Wow! This looks like an AMAZING technique! I love that you gave such detailed instructions so that I can go into my classroom on Monday and try this myself!!! It is so important for students to learn to ask their own questions! What an awesome lesson! I would have been so excited if my students did as well as yours, too!!! Fantastic post!! Having students develop questions is a big area of focus in my school district so I really appreciate how well you explained your lesson. I think I will have to check out the book. I was just reading a post that said the one doing the talking is doing the thinking and the learning and I think your post illustrates that beautifully - as you were observing your students were doing the talking, thinking and learning. I can't wait to share this with my co-workers. What a great strategy to kick off or close a unit of study! Thanks for another great idea! What a terrific lesson, Theresa! I've been trying to get through this book, but keep putting it aside. Your lesson really helped me understand the whole Q-Focus concept much more clearly. I also think it was great to have the students mark their questions as 'closed' vs 'open' because this is essential when thinking about research. Well done! I'm proud of you, my risk taking friend! Thanks for introducing me to a new book. It is now in my cart! Can't wait to read/hear more. This is an AMAZING post!! I love how you described your students in action and how proud you were of their questioning techniques. Isn't it wonderful how students are such little sponges and can just blow our minds?!? Thanks so much for sharing!